Sarah Rogers. Please Note: Whilst every care is taken in checking promoted links, we cannot accept responsibility for your use of third party web links. 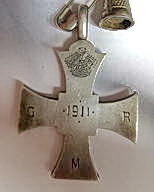 1911 Cross presented to Helene Waddell. 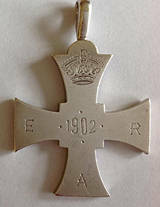 Below is an example of one presented to RVI nurses in 1902, to commemorate the coronation of King Edward V11 and Queen Alexandra on 9th August 1902. 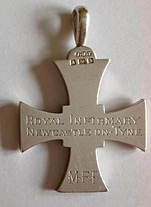 At a meeting of the House Committee of the Royal Infirmary, held on May 1st, 1902 Mr C Irwin proposed and Prof Oliver seconded that a Sub Committee be appointed to take into consideration the question of celebrating the King’s Coronation at the Infirmary. This was unanimously agreed to, and on August 11th, 1902, entertainments were held with marked success. 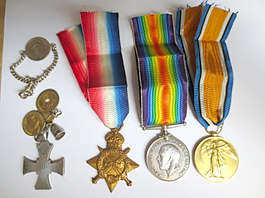 Medals awarded to Sister H. Waddell, also a home-made ID tag, and her RVI cross, with ‘lucky charms attached’. It is not known where Helen worked after the war, her address appears to be in London and she is removed from the nurses’ register after her fee is unpaid in January 1948; at this time she would have been 70 years.17 Helen died in London on 30th December 1949, probate was granted to her brother in law Cyril, who also served in WW1. 1. FreeBMD. England & Wales, Birth Index, 1837-1915, accessed 21st July 2014; The National Archives, 1881 England and Wales Census, RG11/4996/90/10, accessed 21st July 2014. 2. TNA, DT10/61, The General Register of Nurses no 5, p330. 3. Royal Victoria Infirmary, Newcastle 1911 Annual Report; it is hard to be precise, as in the census there are 126 nurses at the RVI, but by the end of 1911 there are 136 nursing staff, oral history from Jane Craft. 4. Maud Frances Telford is the grandmother of Peter Atkinson, oral history Catherine Atkinson. 5. Personal knowledge; http://en.wikipedia.org/wiki/WilliamWatsonArmstrong, accessed 21st July 2014. 6. 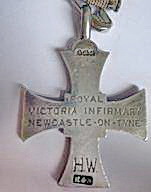 Royal Victoria Infirmary, Newcastle 1911 Annual Report. 7. TNA, WO/399/8580, Helen Waddell. 10. 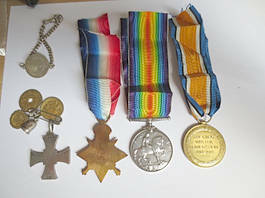 TNA, WO/399/8580, Helen Waddell; TNA WO 95/345, First World War and Army of Occupation War Diaries, Part 1: France, Belgium and Germany, Second Army, 44 Casualty Clearing Station, September 1917. 11. TNA, WO/399/8580, Helen Waddell. 12. TNA, WO/399/8580, Helen Waddell; TNA WO 95/4097, First World War and Army of Occupation War Diaries, Part 1: France, Belgium and Germany, Lines of Communication, 2 Stationary Hospital, January 1918- . 13. TNA WO 95/4097, First World War and Army of Occupation War Diaries, Part 1: France, Belgium and Germany, Lines of Communication, 2 Stationary Hospital, 31st May 1918. 14. TNA WO 95/4097, First World War and Army of Occupation War Diaries, Part 1: France, Belgium and Germany, Lines of Communication, 2 Stationary Hospital, January 1918- July 1919. 16. TNA, WO/399/8580, Helen Waddell; TNA WO 95/4097, First World War and Army of Occupation War Diaries, Part 1: France, Belgium and Germany, Lines of Communication, 2 Stationary Hospital, 7th August 1918. 17. TNA, DT10/61, The General Register of Nurses no 5, p330; Ancestry.com. England & Wales, National Probate Calendar (Index of Wills and Administrations), 1858-1966. Many thanks to all those who have helped in this research, Anne Craft, Helen Lamont, Catherine Atkinson, the RCN Archivists, and Will for uploading to SON. Copyright, Sarah Rogers, 6th August 2014.